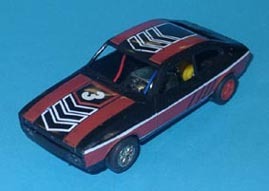 Scalex MKIII bodyshell bought at Slough Slot car swapmeet. An uncut but pretty scruffy bare shell (no windows/bumpers/lights etc) put on a chassis found in my crap box. Some glue damage around the bumpers mounts but this won't be seen.Should end up like my brother in law Huw's 1976 MKII 1600 (minus the rust) seen here photograped when 10 years old and already pretty much had it.Doors wouldn't lock, tailgate wouldn't stay up, wings were hanging off and the head cracked but surprisingly it was still great fun! Major differences as far as I can tell are confined to the front end/grill area so should be straight forward.Bonnet is lower between the lights than the MKIII with a different grill plus the 1600 has the big square headlights which can be made from Perspex. Since picture was taken tampo printing has been removed first with meths (no smoking and do it outside or you'll blow your head off one way or the other) then finished with T Cut to get the last traces. 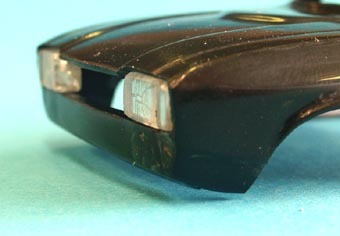 MKII bumpers are completely different to the Scalex MKIIIs, being simple wide flat chrome affairs rather than the later black items which have over riders and extend round the corners onto the wings. The rear MKIII bumpers extend all the way forward to the rear wheel arches and the Scalex shell has a channel to accomodate this, this has to be filled. Bumpers though should be simple to make. If anyone can help with the supply of a set of SCX Fiesta MK1/Renault 5 wheels & tyres (or even cheap rough car) plus a Capri windscreen or tail lights I'd be grateful. ( - I am grateful to Robert at Westwood Models who has managed to supply a suitable Fiesta, however more wheels would still be useful! Glass and tail lights still required although I am working on alternatives. After the tampo had been removed I removed the mold witness lines (ridges where the pieces of the original multi piece injection mold met) from the roof and wings with fine paper and gave the shell a polish, looked really cool in plain black! First major problem is the front skirt, the Scalex MKIII has a spoiler on the front skirt which the MKII doesn't. Unfortunately there isn't sufficient material behind it to allow the correct profile to be sanded into it. I could have added material behind it but I came up with an ingenius idea. I have access to a hot wire cutter (used to cut expanded polystyrene and as the name suggests basically a hot wire) which allows you to heat up a thin straight line of plastic for bending. Vs were cut out of the corners and each section heated and hinged inwards to form the correct shape. A bit of a fill and sand and the correct profile to the bottom of the arch and Bobs your uncle (actually he's my brother but thats another story). Not really visible in the picture but I had to also shape a step into the bottom corner of the wing to match the step along the rest of the car. At the wheel arch it is level with the step the other side but then slants up to about where the middle of the bumper will be. I will have to do the same on the rear wing after the slot for the bumper is filled. After inspecting a few old photographs of the 1600 I decided that it wasn't so much that the grill was lower than the headlights but that the headlights were higher than the grill (eh?). In the photos the bonnet edge is cut back around the lights so they are just visible when looking down on it, rather than straight across as on the MKIII. The bonnet was cut away to match this and then headlight/indicator units were shaped and polished from some 5mm Perspex and a cut put in with a razor saw to mark the divide with the indicators. 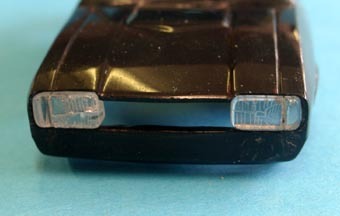 They looked a little bare so an approximation of the headlight pattern was scratched in with a scriber. Its not as pronounced in real life as it looks in the photographs! Backs will probably be painted silver. 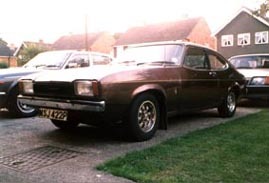 Next job will be the grill and I'm looking at an Airfix MK1 Capri to be the basis of chassis and interior. If I can't get hold of a Scalex window unit I will try and vac form one.